You are working out hard, eating well, but the scale will not move! This is extremely frustrating and can leave you ready to give up. There are a many possibilities as to why you are working hard and not seeing the results you want. The scale is only one tool for measuring weight loss. And to perfectly honest, it is not the best one to rely on. The scale measures how much you weigh, but it doesn’t tell you much about the state of your health. You can weigh 120 lbs and still be unhealthy! If I could talk you into throwing the scale out the window, I would. Have you ever noticed that you weigh in and see a number that looks pretty good, so you figure you can eat more because you are doing so well? Or perhaps you weighed in and saw a number you were not happy with, which completely ruined your morning and left you wanting to give up? If you must use a scale, let it be one of a few tools you use. Don’t let it consume you. You might also note that plenty of people have gained beautiful, sculpted muscle and looked healthier and thinner, but actually weigh more. Muscle weighs more than fat. 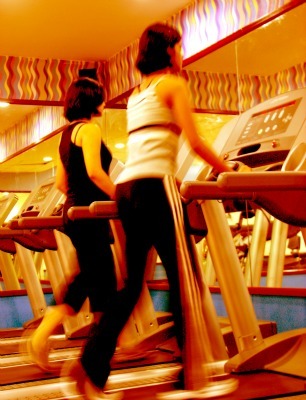 If you are walking or running on the treadmill day in and day out you might not be doing yourself any favors. I’m not saying to NEVER do steady state cardio, but if you are relying on it as the main stay of your workout plan, you are likely to plateau and stop losing weight. Interval training gets rid of body fat much more effectively. It’s generally tougher to do an interval workout than walk on the treadmill while watching a tv show or reading a magazine, but the benefits are worth it, I assure you. Interval training (or HIIT) burns more fat for hours after your workout than steady state cardio, hands down. For more information, see our post: What is a HIIT workout? Another problem with steady state cardio is that your body adapts to it. If you are doing the same thing over and over, your body learns to accommodate the activity. 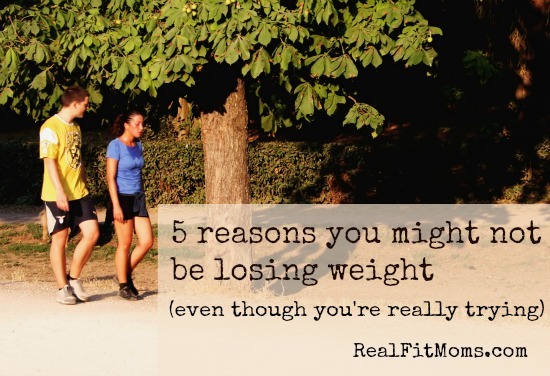 Although it might have helped you lose weight at first, it stops working. Interval training keeps your body guessing. Which is another good reason to add it to your workout repertoire. Weight lifting is also your friend. Creating muscle means creating extra fat-burning machines that work around the clock. If you are a busy person (who isn’t? ), it’s easy to become distracted and forget how much you actually consume. Keeping a food journal for a while can help you see exactly what you are eating. It may also be prudent to look at any beverages you drink on a regular basis. It’s pretty easy to gulp down a ton of calories or sugar without realizing it. Many drinks are marketed as “healthy” but are actually full of sugar. This is also true of many “low-fat” varieties of foods, especially things like yogurt. Low fat or non-fat often equates to higher sugar content. Read labels to make sure you know what you are eating. A number of studies have shown that the amount (and quality) of sleep you get each night directly influence your health, especially your weight. This is mostly due to hormone imbalances caused by lack of sleep, but even without the science I can personally attest to eating more when I’m tired. And not just more but lower quality foods. If I’m exhausted I’m less likely to tale the time to prepare a good meal, and can often be found scrounging around the cabinet for something sweet in the hopes of getting an energy rush (which doesn’t actually work, by the way). If you want ro read more about the studies and science behind this, check out How Sleep Affects Your Weight. Eating too little food for a long period of time damages your metabolism. Your body adapts to it’s food intake and activity levels, which means it will learn to function on less food. Your body does not want to starve. Eating too little also leads to binge eating. This can pack on a few pounds very quickly. Not to mention load you down with guilt. Eat good food. Real food. And eat enough to satisfy you. It is very frustrating to work so hard and not see results, and sometimes it is very difficult to see what is causing us trouble. Step back and take a look at what you are doing on a consistent basis and see if anything of these 5 reasons could be hindering your progress. But do please remember, health is more important than skinny!